Two Eyed Red Cupid is an AQHA perlino dun Stallion. Thankyou to his owner Gayle for sharing her photos of this lovely stallion with us. 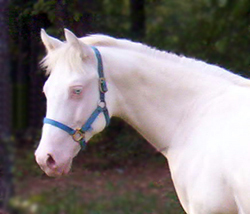 Cupid will be standing at stud at Zohar Arabians (Texarkana, Arkansas) when he gets a bit older.